How is it possible for these two stories to appear in the BBC RSS feed at the same time? People in America would rather entrust their struggling economy to a man who can't answer a question about how many homes he has? Are people really that convinced that only a Republican can possibly know what's good for the economy? At least we now know that McCain's grasp of his personal finances is no better than his grasp of America's. I'd be content to sit back and laugh if the American economy wasn't so likely to drag half of Europe down with it. As it is I feel like screaming at the stupidity of it all. 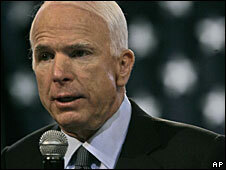 Democratic presidential hopeful Barack Obama has attacked his rival John McCain for not knowing how many homes he owns.